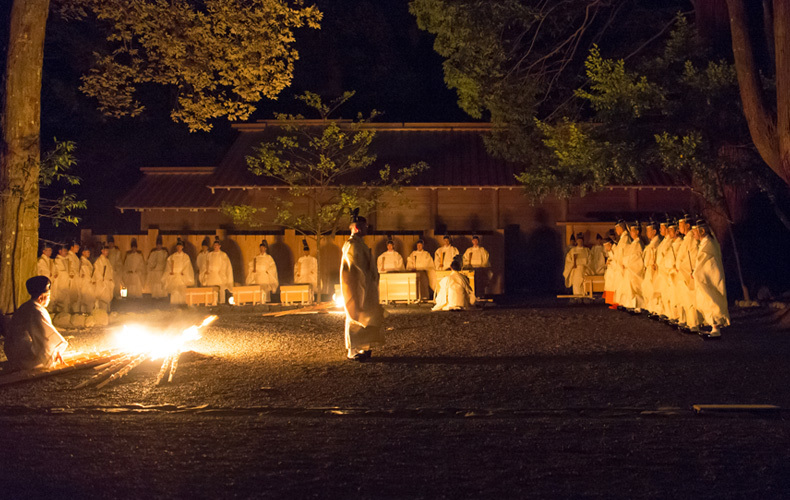 Rituals and ceremonies of Ise Jingu to pray for the prosperity of the Imperial family, the peace of the world, and the huge harvest, are performed by the priesthood of Jingu under the direction of Amaterasu-Omikami’s direct descendent, the Emperor. 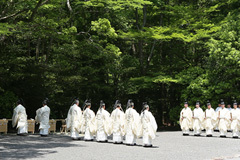 Thus these rituals and ceremonies conducted at Jingu can be referred to as the Imperial rituals. These rituals are roughly divided into three groups. The first includes regularly conducted daily and annual rituals. 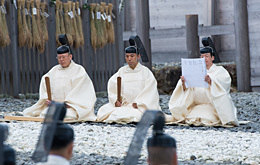 The second are extraordinary rituals, which are conducted on special occasions for the benefit of the Imperial Family, the nation, or Jingu. 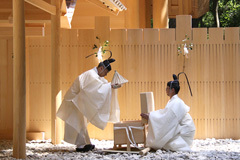 The third are rituals for Shikinen Sengu conducted every twenty years. For certain important rituals among these groups, the Emperor sends the Imperial Envoy to Jingu to dedicate textiles called heihaku. 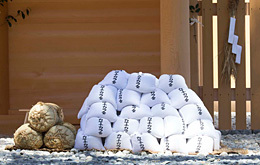 Annual rituals are based on the cycle of rice cultivation. 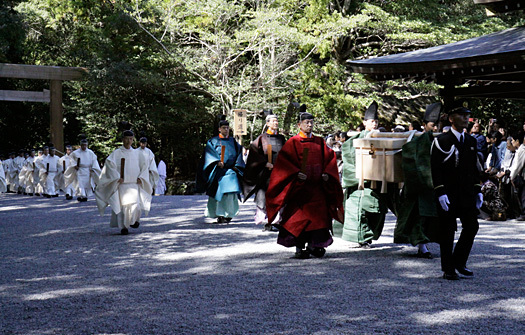 The most important ceremony of the year is Kanname-sai, during which Jingu priests offer the first rice of the year harvested in Jingu and dedicate a prayer of gratitude to Amaterasu-Omikami for presenting the first rice to the terrestrial world through her grandson. At Kanname-sai, an ear of new rice grown by the Emperor is also dedicated to Amaterasu-Omikami. Every twenty years, a new divine palace with the same dimensions as the current one is constructed at an alternate site which is adjacent to the main sanctuary. It involves about 30 rituals and ceremonies beginning with the ritual cutting of the first trees for the new divine palace. The sacred apparel, furnishings and divine treasures to be placed inside the sacred palace are also remade. 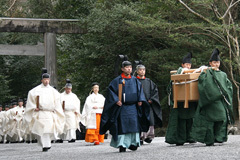 Once they are prepared, the Holy Mirror (a symbol of Amaterasu-Omikami) is moved to the new sanctuary by the Jingu priests. 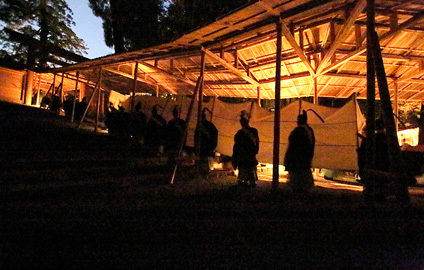 This ritual is called Shikinen Sengu. 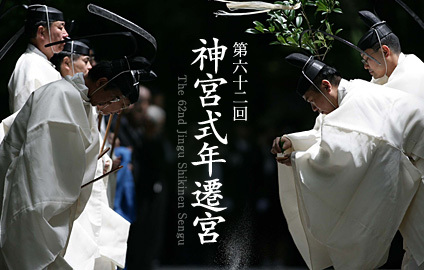 It takes about eight years to conduct all rituals and events for Shikinen Sengu. 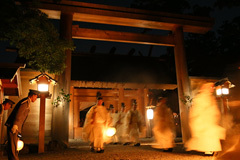 It is carried out at Geku and other jinja of Jingu as well. 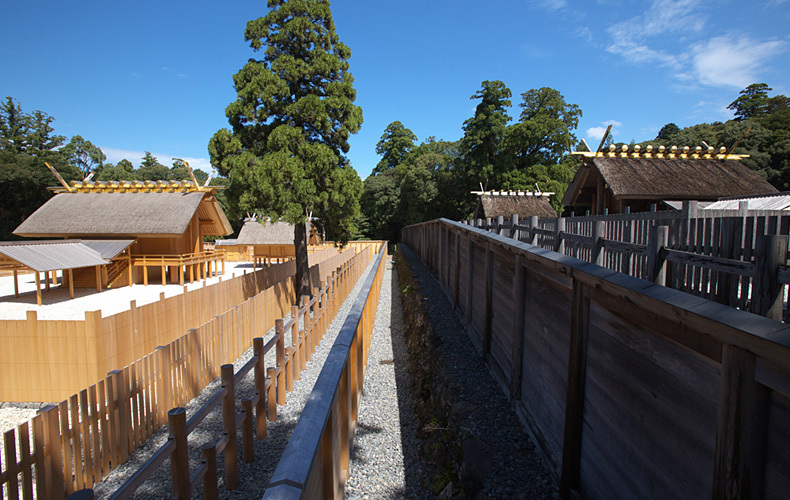 The first Shikinen Sengu of Naiku was conducted in 690, in the era of the 41st emperor Jito. 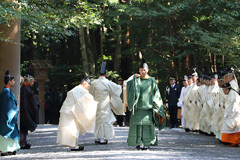 The latest Shikinen Sengu conducted in 2013 was sixty-second. Copyright © 2015 Jingushicho. All Rights Reserved.